Sri Lanka has rejected an Indian proposal that Tamil Nadu fishermen be allowed to fish in our territorial waters at least one day a week. The proposal had emerged from the Indian High Commission in Colombo during consultations with officials of the Ministry of Fisheries. 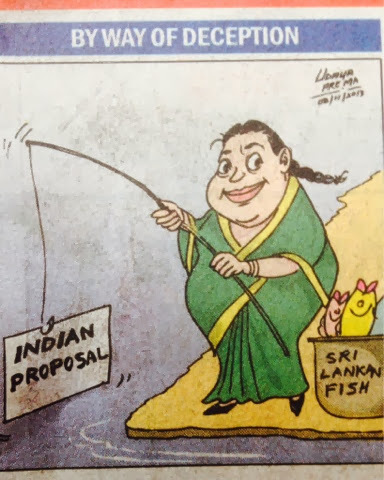 Both Fisheries Minister Rajitha Senaratne and a High Commission official declined comment on New Delhi’s offer.At present, Tamil Nadu fishermen unilaterally conduct fishing activity in Sri Lankan waters in the Palk Strait on three days of the week. They had urged local fishermen to keep away prompting the Government to order arrests of poachers. Such arrests have been further warranted by complaints of ‘bottom trawling’ by Tamil Nadu fishermen thus destroying all marine life on the sea bed. Reports from Jaffna said the Indian proposal was placed before local fishermen by Minister Senaratne. They were, however, not in favour of the move. Diplomatic sources said the Indian proposal was intended to ease pressure on the New Delhi Government by Tamil Nadu politicians. However, the Sri Lankan Government has taken up the position that it would not be possible to heed the request for several reasons. Besides the serious damage to marine life, Sri Lankan officials point out that such a move would be tantamount to an admission that Tamil Nadu fishermen were now given rights to poach one day a week. The Sunday Times has made a series of exposures on poaching by Tamil Nadu fishermen. The exposures led to the European Union’s Sri Lanka delegation chief, David Daly, on Friday meeting Jaffna’s Government Agent Sunderam Arumainayagam to obtain a first-hand account of how Tamil Nadu fishermen were poaching in Sri Lankan waters. The EU has strict legislation applicable to illegal fishing methods like ‘bottom trawling.” Exports of fish harvested through such methods are banned. An EU spokesperson said, however, the Sri Lanka Government is yet to officially inform the EU about the poaching issue.